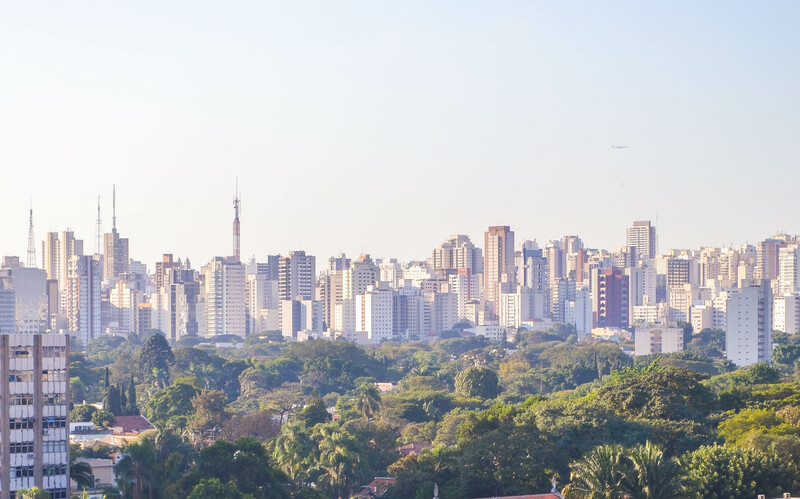 Sao Paulo was a rarity for us, normally as soon as we step off the plane or boat we are already falling in love with a city, but when visiting Sao Paulo, it took us a while to find the charm. After the first few hours we were concerned this was going to be the first place where we would go home and say, ‘nah give that a miss,’ but after putting in some hard graft we started falling. Sao Paulo in our opinion is like a cat, it makes you work and work for its affection, but once you’re in and its accepted you, there is so much it has to offer. Now, this rough start wasn’t fully Sao Paulo’s bad, we (mainly Natalie) had done some bad planning. Firstly, we had arranged to go during a public holiday so pretty much everywhere and everything was shut. All the attractions and sights which we had wanted to explore were a no go’s and we were stuck in town without a clue and worst of all no wi-fi to fix that – problem number one. Secondly, it was Gay Pride, something which in many other counties would be a huge positive and an event you would actively seek out or go because of. Unfortunately, not here, Brazil still has a negative reputation for its attitude towards LGBT, with one of the highest hate-based LGBT murders statistics in the world. This meant there was a slightly tense atmosphere in the air. Luckily, we didn’t see anything which confirmed its reputation and we’re sure travelling here and being part of the LGBT community would be completely uneventful, however, tense would be the word. Finally, in preparation for the Rio Olympics and as a test dummy city, the favelas surrounding Sao Paulo had just been cleared so a lot of the residence had moved into the capital having unfortunately been made homeless. This sight was chilling as you couldn’t walk two steps with nearly tripping over someone on the sidewalk which also broke our hearts. Not an ideal set-up to say the least. Clearly, we hadn’t chosen a fantastic time to go and it did affect our first impressions of the city. We were staying in the business district so after a very unsuccessful trip into the centre we quickly escaped back to our hotel. When travelling we enjoy being in the thick of things so retreating back to the hotel felt almost defeatist and that we were hiding in our luxury castle not really getting to know the raw city. We have travelled our fair share of tricky countries such as India, Jordan and Sri Lanka (while there was still tension from the civil war in the north) without concern but here we just felt a little unsettled. Award for the number 1 travel bloggers of the year we think not. On the other hand, Sao Paulo has some amazing, modern and inexpensive hotels to pick from so (embarrassingly) we had an afternoon by the pool and drinking caipirinhas – something we drank way too much out there! But they are delicious so who can blame us? For dinner we decided to stay in the same area and headed to Hotel Unique. It is a stunning, modern and artistic hotel with an incredible rooftop bar and restaurant which serves a Japanese-Brazilian fusion menu – to die for. The views over the city at night were quite spectacular and we couldn’t recommend it enough. Sao Paulo has a slight resemblance to NYC or Mumbai at night time with its high-rise buildings and twinkling bright lights. It is not a budget restaurant but worth it so… when in Sao Paulo right!? After an amazing evening, the next day we strapped on our shoes and headed back out. We were determined to take on Sao Paulo and find our flavour. We had read about a huge art district which housed the famous Batman Ally. Yes, it has an awesome name! Batman Ally we had heard was an amazing ally covered head to toe in street art. Right up our ally… yes, we did just make that joke! Now, it wasn’t the easiest thing to find, poorly signposted and with a lot of the locals looking at you blankly when you mentioned it, it took us a long while to find. At some points we though it could be this crazy urban myth that people search for their entire lives for and never found. However, finally, we started to see colour on all the walls, getting more and more intense as we continued to walk. Suddenly, we turned a corner and there it was in all its glory. We spent hours walking up and down. There was so much to see, and each piece had its own draw. This was our light in Sao Paulo and something which cannot be missed if you plan on visiting the city! Annoyingly, soon after we had to head to the airport to fly back to Rio. After the inspiration of Batman Ally we were starting to see amazing street art covering every corner of the city, but it was too late and time to leave. After a taste of its charm we were genuinely gutted that we had to leave, we had just broken through the wall and wanted to keep on running and see as much as we could, now feeling more comfortable and energised by the city. We scolded ourselves for being so shy and retreating back to the hotel the day before and not pushing on and finding this side sooner. Overall, Sao Paulo was hard work, but we believe we found its charm. We wish we had had longer there to explore and it’s not somewhere we would rule our ever going again. Great tips. The batman’s alley in São Paulo is a wonderful tourist spot, especially at night, when several people gather at the nearby bars. Sao Paulo is for the average european really hard to discover….while u are usually used to go to the “historic center” in Sao Paulo it only worth a fast look. The real nice place are more scattered in the areas around. Batmans Alley was a good start, the neighbourhood Vila Madalena around has a vibrant nightlife and very active art scene. You should have definetely spend ur day and night there. Especially on saturday the Samba Parties are amazing, starting at lunchtime. To get a “city breathe” u should have visited Avenida Paulista, which is the modern centre and pretty impressive and reminding a bit of New York. And the Ibirapuera Park (Thats Sao Paulos Central Park) on a sunny weekend is very pretty and you can see all locals enjoying the sun. Not to mention the big amount of art museums and galleries, especially next to Ibirapuera you have the MAC USP Museum with free entrance and contemporary art and an amazing view from the roof terrace to the park. If u ever pass by Sao Paulo again.Give it a try, catch the metro linha4 (very modern and clean) and get off at Fradique Coutinho, Avenida Paulista and Oscar Freire. And just walk around and discover. Greetings from lovely and interesting Sao Paulo City.